The Alliance of American Football, which has played just eight weeks of games in its inaugural season, is suspending operations. There are multiple reports, from Mike Florio of Pro Football Talk and Daniel Kaplan of Sports Business Journal, that the fledgling league is at minimum ceasing all football operations on Tuesday though it isn’t folding entirely — yet. Darren Rovell of The Action Network reports that the decision is being made by league owner Tom Dundon over the objections of founders Charlie Ebersol and Bill Polian. There is a conference call scheduled for Tuesday afternoon that should shed more light on the situation. Aditi Kinkhabwala of NFL Network said an email was sent that left the door open for the league to resume, but it didn’t sound too promising. There have been stories for weeks that the league quickly ran into financial trouble, and those clearly continued despite the influx of money from Dundon. Rovell wrote that Dundon will lose $70 million on the investment he made. 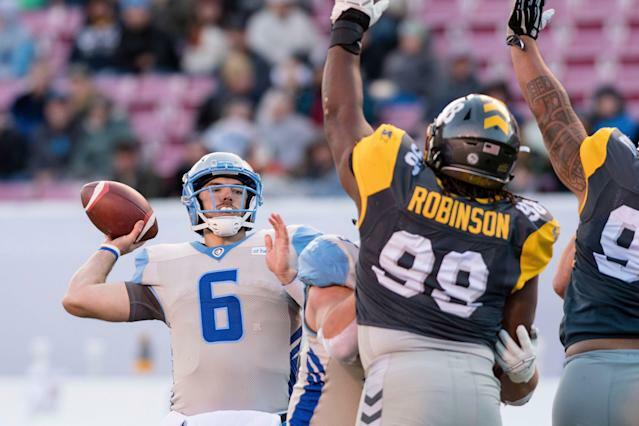 The AAF had a great opening weekend back in February, playing its first-ever games the Sunday after the Super Bowl and successfully pulling in fans who weren’t ready to go months without their favorite sport. But those ratings were short-lived, and Dundon, who also owns the NHL’s Carolina Hurricanes, had to step in with a major financial investment. Last week, Dundon told USA Today that the league needed the help of the NFL Players Association and its permission to use NFL players. Albert Breer of The MMQB reported that the NFLPA was in talks with the AAF, but the union was surprised when Dundon went public with the plea for help. Blaming the NFLPA for their problems seems short-sighted at best; if the AAF wanted to partner with the NFL and NFLPA, it should have done so before it ran into dire straights. Which, in this case, seems like it should have happened before any games were even played.